Particularly gorgeous Oldenburger gelding 2016 by Jazzman/Romanov/Diamond Hit born 04.05.2016 out of one of the best Oldenburger dam lines (Waldhexe line) with all the qualities to be successful in the top amateur sport! This young gelding is very flashy with exceptional movements and an alert and confident personality! 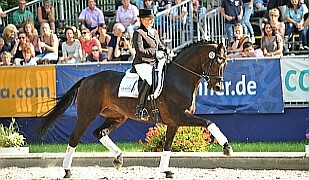 There is no question, he is going to be noticed, whether it is in the dressage arena or as lovely partner for all days ! Of course premium colt in Oldenburg 2016 by his foal show. Currently castrated and so still unbroken. Standing in gelding/stallion group in open stable. But very well educated and knows of course all basic elemente wich are important for a young horse. The dam line is one of the most valuable lines in Oldenburg, the Waldhexe line! Dam and the next 3 generations are state premium mares. 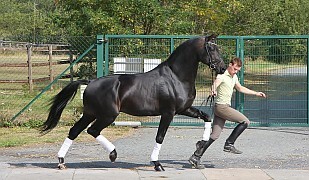 A full brother to his dam is the licensed stallion and winner of the qualification for the Bundeschampionship of the 6-year old dressage horses with a score of 9.0 and now successful in Grand Prix. Older full brother to the gelding was of course premium colt and nominated for the Oldenburger eliteauction . 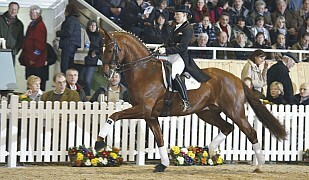 Granddam was state winner mare in Oldenburg and finalist at the Bundeschampionship. Great-granddam is 3x stallion mother as well as mother of several internationally successful sport horse and premium mares. 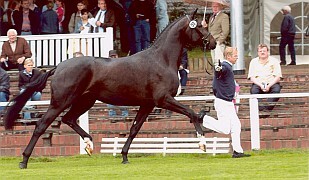 Sire Jazzman as breeding index highest son of the dutch starshire Jazz under the top 25 % in German breeding list. 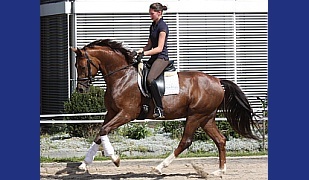 Grand sire Romanov Elite stallion Denmark, the VTV Dressage Stallion in Oldenburg and an exception in sport and breeding stallion. Diamond Hit is an esablished hero among the international ttp sires- one of the performanced- stronges offers from the parantal home of Donnerhall. 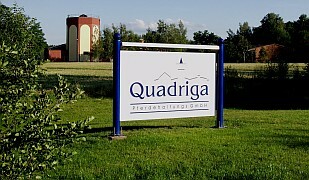 Diamond Hit is "purveyor" for auction sites Bundeschampionat and Wold Championships of young dressage horses. Dreamboy in typ, movements and pedigree !! !